Eugene Felix Saucier was born near Richwoods, Washington County, Missouri January 11, 1841, the son of Eugene Frederick Saucier and Pelagie Roussin. Much of his early life was spent on his father’s farm (his birthplace) which lies some 1/2 miles northwest of Richwoods, Missouri and which is now (1947) known as the Schnitzius farm. Here he received his schooling from his father who was a farmer, teacher, and musician – and an able scholar with a thorough knowledge of both the French and English languages. At the age of 14 the subject of our sketch accompanied a party including his father and other relatives and neighbors on a trek with ox-teams to California in search of gold. After a fruitless search of some 3 years he and his father, among others of the party, reached home again. They came by boat to Panama, crossed the isthmus on foot, sailed to New Orleans, then by boat up the Mississippi River to St. Louis. From St. Louis they went by train to Pacific, Missouri which was at that time the terminus of the MoPac Railroad. The last 40 miles from Pacific to Richwoods were made on foot. During the entire 3 years they were entirely out of contact with their home and family. He worked on his father’s farm until 1862 when at the age of 21 he enlisted in the Union Army in the war between the States. He was eager to enlist at the beginning of the war (1861) with a Company of the 13th Cavalry, which was recruited in Richwoods at that time, but respected his mother’s protest because he was not yet of age. Had he gone with the 13th Cavalry our story might not be, as this contingent was, to all practical purposes, liquidated. His enlistment in the Union Army portrays much of his nature and character. He was opposed in this decision by his entire family whose sympathies were all with the South. He was always forthright and steadfast in the line of duty, as he saw it, regardless of sacrifices on his part. He greatly admired Lincoln and was very much like him in many respects – scrupulously honest, keenly sympathetic, studious, and industrious, having great respect for honest toil and a keen sense of fair play at all times, and for all people. After having served his country for 3 years he received his discharge as a Sergeant in Company K, 35th Missouri Infantry (at the close of the war) at Little Rock, Arkansas, June 28, 1865. He then returned home resuming duties on his father’s farm where he had left them. When he decided to answer his country’s call he was harvesting oats with a cradle; upon his return he picked up the same cradle in the same field to harvest oats again. This, too, portrays something of the nature of the man – great self control and faithfulness to duty. Shortly after the close of the war he was married to Miss Nancy Rice the adopted daughter of James Patton a Washington County farmer. To this union were born three children, William A. Saucier who survived and a pair of twins who died at birth, as did their mother. During this short period in his own home he followed in his father’s footsteps as a farmer and teacher and lived on what is known as the Patton farm on Indian Creek in Washington County, Missouri. The final resting place of his wife, marked with a small head-stone still bearing her name, is on this same farm. After the death of his wife he went to Reedville, Franklin County, Missouri which was then a thriving mining town. Here he served as clerk in the store of Major James A. Cook who had a general store. He fell in love with one of the Major’s daughters (Louise A.) and they were married in the little Catholic church which was later replaced by the present St. Stephen’s Church in Richwoods, Missouri. Incidentally, all of the land belonging to this church was given by his maternal grandfather, Stephen Roussin and his father served as organist in this church and also in the one at Old Mines, Missouri – which is still standing little altered even today (1947). Soon after his second marriage he settled down to farming and teaching at Reedville, Missouri. He was getting well established when his third child by this second marriage died in its second year. This sorrow so bore him down that he wanted to get away from all that was familiar there, so sold out and moved back to the farm on Indian Creek where he continued teaching, but for only one year. Then he came back to a farm near Reedville again and resumed his teaching there. After a few more years of teaching (which was never to his liking) he gave it up and turned his attention to farming and stock-raising which he followed the rest of his life. The last ten or twelve years of his life were spent on a large grain and stock farm which he and his older sons owned in partnership. This is a Meramec River farm about 2 miles southeast of Stanton, Missouri. It was known then as the Big Spring Farm, but later was named The Twin Springs and was developed into a tourist resort. It was on this farm that he passed away after a week’s illness of heart trouble, December 16, 1913 at the age of 72 years, 11 months, 2 days. He was buried from the Catholic church at Sullivan, Missouri and rests in the church cemetery some two miles northeast of Sullivan. His father, Eugene Frederick, was born at Portage Des Sioux and spent part of his early life in St. Louis. He was a musician of note playing piano, organ and guitar. He was the first organist in the old cathedral, the first Catholic church in St. Louis at 4th & Walnut Streets. He was a student in a seminary studying for the priest-hood when he met and fell in love with a black-eyed French girl, Pelagie Roussin, whom he married. 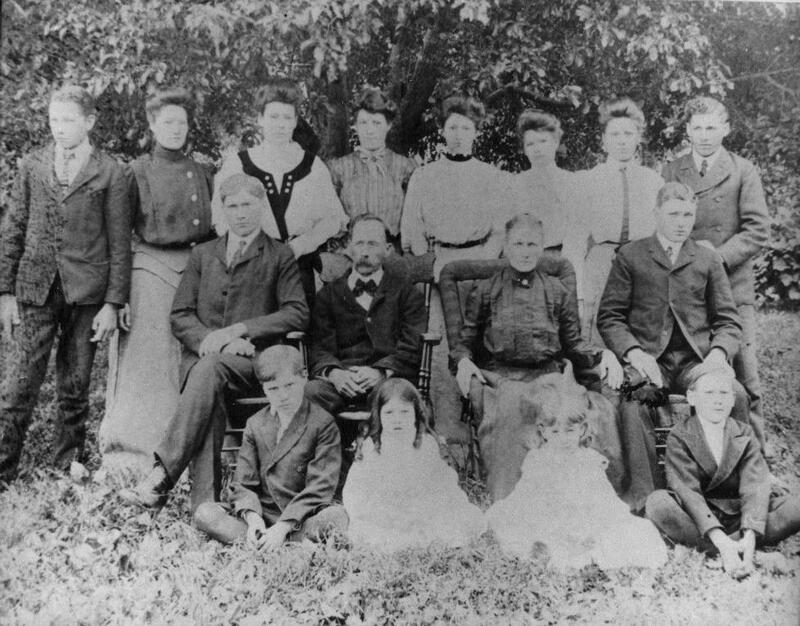 The children of this union who became grown were Zoe, Eugene, Jennie, Belle, Emily, and Frank. Eugene knew the value of education and encouraged his children in that respect, giving them the best opportunities that he could. He served on the school board of the Reedville school most of while a resident there – in the capacity of president of the board. This was the same school in which he had begun his teaching career. His leisure time was spent largely in reading – reading anything that was at hand. In this way, and through his travel experiences he acquired much knowledge and a broad outlook on life, which made him an outstanding figure in the little country community where he lived He was held in high esteem by his associates who often sought his advice in matters of dispute. His children were often inspired to nobler, better living by his example and advice. He was very conscious of his responsibilities as a father, and stood strictly against using, or serving alcoholic liquors. Knowing his election was practically impossible in a county so wet as Franklin County yet he allowed his name to be placed on the ballot for county judge by the temperance party. He was more than willing for all to know just where he stood on this question. He often delighted his children recounting his childhood experiences, war experiences, and incidents of his trip to California as all sat grouped around the fire on winter evenings, and around the door-step on summer evenings. During these sessions many other subjects were also discussed – the lives of great men, who had lived down through the ages from the times of the Greeks & Romans to the present, the moon & stars – he could discourse intelligently on almost any subject. He had a keen ear for music and knew most of the folk-songs of the day, which he had learned to sing at his father’s side when a child, to the accompaniment of the piano or guitar. These he often sang for his children when they requested it, affording much pleasure as well as giving them an introduction to music – which was a scarce article in the little neighborhood at that time. He was a quiet, peaceable man, and a kind & indulgent father & husband. C’est un magnifique portrait de ta famille! This is a great work of remembrance. You and your family truly belong to the History of the States. I am happy to learn how French you are! Thanks, I’m glad that you enjoyed it. I’ve got a few more of Aunt Hattie’s stories tucked away that I’ll drag out someday, but my favorite story will have to wait. Your post on the frigate Hermione has given me ideas for yet another quilt. Jean Baptiste Saucier’s wife came to America on the warship Pélican along with 22 other young, unmarried women – now that’s a story! Wow! Such a quilt would be great! So glad you’ve shared another of the stories from your family. It was a pleasure to read this. Even better: to have been one of the children sitting around the fire on a cold evening or the doorstep on a summer evening, listening directly to his stories or his music. It’s funny you should mention the doorstep – it was a salvaged mill stone. My father would take us out to the Big Springs farmhouse when we were in the area (it was used as a hay barn in those later years). Dad would start out showing me where the old wagon road was, the road that his father James used when courting Ida (my grandparents). Then he’d point out where to dig, and there we’d find the mill stone, still in place after all those years. It’s probably still there for all I know. We are apparently “cousins”. My grandmother Josephine Saucier (Cowan) was one of Hattie’s younger sisters. Thanks for the stories — I’d love to hear more! And hello to you, cousin! Odd that you should pop up today, just this afternoon I was reading the transcription of a letter written to your grandmother, my grand aunt Jo. You’ve probably read it before, it was written by her brother Ben during WWI, but I’ll try to get it posted very soon just in case you haven’t. I was in touch with some other Cowan cousins back in the 90s – sadly, I lost touch thru all of my moving around, changing computers, email accounts, &tc. So glad you found my blog! Your blog and stories and pictures are a treasure to me! So glad another distant cousin left me a message on my ancestry site giving me your information! My great-grandmother was William Saucier’s daughter Loreta Saucier. Of interesting note, my mother has Eugene’s war medal/ribbon given to him on his discharge from the army. Apparently it was given to William when Eugene died. If you send me your email address, I will take a photo of it next time I see my parents and send over a picture of it. Might be fun to add to the family archives. Thanks for posting all these great stories and history. Fun to see the way the family tree spreads out and then gets small again with the internet. Aha – and another cousin weighs in! Hello Ben, so glad you stumbled across my blog and left a comment. Will drop you an email very soon – and I promise, I’ll keep my nosiness turned down low. Hello, I’m excited to find this blog about the Saucier family. My great-great- grandmother was Emily. Good morning, cousin Karen! I’m very happy you stumbled across this blog as well. When you say that your gg-grandmother was Emily, do you mean Eugene and Pelagie’s daughter Emily L. Saucier Waldbart? I have a photograph of Emily, and I thought that I’d posted it… sadly Emily was MIA, but that omission has been fixed as of now. If you’re interested, you can find her up in the sidebar between her sister Zoe and brother Eugene. Thank you so much for posting that picture up. It’s nice to put a face with the name. You’re very welcome, cousin. I thought that I had it posted, but perhaps when I gave my blog its last facelift, I forgot to load it back in. I really should go through the photos and see if I’ve forgotten anyone else.